Here is an interesting puzzle that was published in The Guardian on Monday. 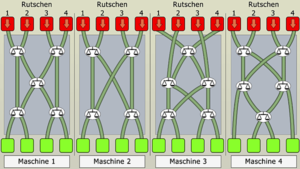 The challenges is to find which of the four machines will sort objects into increasing order of weight. 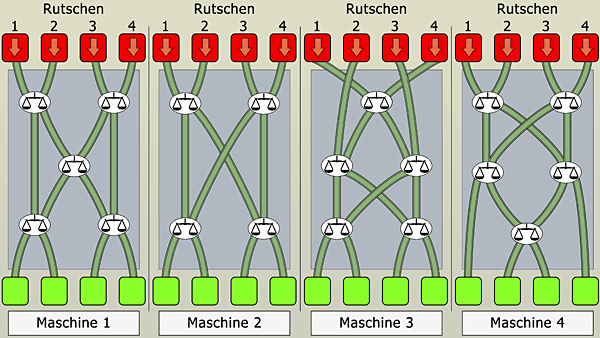 The way the machines work is that the four objects start at the top and fall through the slides. When they meet at one of those scales at a junction, the lighter object is sent to the left. The problem is not very difficult to solve. It was originally set for German middle-schoolers. It can certainly be solved using trial and error. I want to explain how I solved it in order to make a point about how human intuition works. I first saw the problem in the morning on my phone. I was busy with getting my son ready for school and so couldn’t spend time staring at the four machines trying to figure out the pathways. This constraint proved to be key to solving the problem quickly. Because I was unable to look at the machines and also was unable to let go of the problem, I decided to think of how I would design a machine if I were doing it de novo. The thought occurred to me that I could model this as a tournament between four players. I could have a semi-final, followed by a final and a third place playoff. Would that work? Close, but not quite. You have four players A, B, C and D. A defeats B and C defeats D in the semis. A and C meet in the final while B and D in the third place playoff. Say that A defeats C while B defeats D. We can be sure that A is at the first place while D is at the last, but we aren’t sure of the relative standing of B vs. C. So you’d need a second place playoff between the loser of the final and the winner of the third place playoff (which means that the third place playoff only decides the fourth place, not third place). This arrangement will get all the players arranged in order of weight. Armed with this knowledge, I sneaked back to my phone and looked at the four machines once again. Aha! Machine #4 implements the exact design I had thought up, so it must be a right answer. Great, but can we be sure that the other three are incorrectly designed? I took another look, and sure enough, another pattern jumped out. Machine #2 is really the tournament without the second place playoff, and we know that it has a weakness, so it’s out. Now, look at Machine #3. It looks very messy, but it is possible to disentangle the wires a bit. You see that there is a playoff between #1 and #4, but other than that it is really Machine #2! It is a tournament with a semifinal, a final and a third place playoff, with an added twist that before the semifinals, two random players have had a playoff and the lighter of the two goes to the left. Does this do anything to do away with Machine #2’s weakness? Not really. That leaves Machine #1. I couldn’t compare or contrast this one with the other three. Figuring this one out turned out to be a matter of staring at it a bit. It occurred to me that in that machine, the heavier of #3 and#4 would always end up in the third or fourth position. Likewise, the lighter of #1 and #2 would always take the first or second position. That couldn’t be right, and it wasn’t. So there, the problem is solved. No need for any trial and error. Of course, this approach wouldn’t have occurred to me if I hadn’t had to step away from the problem. And no, it doesn’t mean that stepping away from the problem is the way to obtain insight. It just means that human intuition is weird.